Air Jordan 1 GS Making Noise! 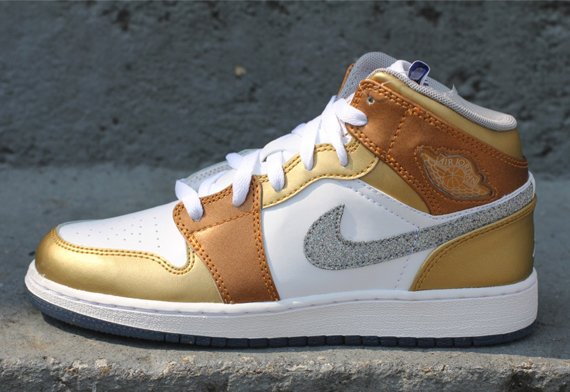 The Air Jordan Golden Moment Pack hit strides since it was released a week ago, but the Air Jordan 1 Phat GS has been enjoying a fair share of the spotlight. This new edition of the Air Jordan 1 Phat GS, the White/Matte Silver-Metallic Gold-White colorway, is obviously an Olympic-inspired kick with the color of the gold, silver, and bronze medals appearing throughout the shoe. The Gold, Silver, and Copper hints are combined with a white leather upper that sits on a white midsole and translucent outsole. Get one now before it’s too late!